We ship you an entire box containing 12 pounds (cut into four 3 pound pieces and vacuum sealed ) of Pork Roll. Keep some out for immediate use and freeze the rest for those future urges. 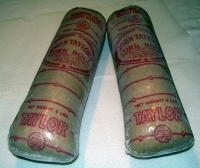 Taylor Pork Roll is shipped frozen in an insulated cooler with additional gel packs to maintain refrigeration during shipping. Price includes shipping.